Our transactional email solution allows you to send individual emails through Campaign Monitor when a Salesforce record is updated. 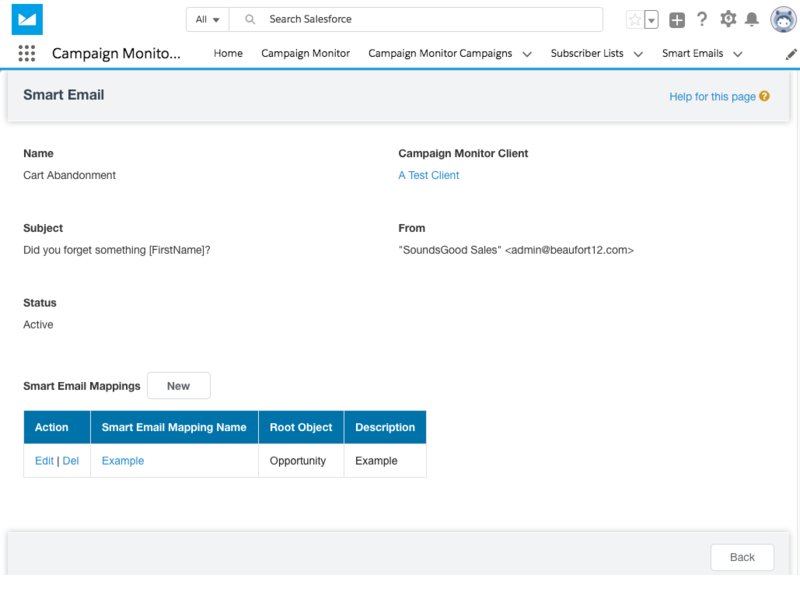 This allows you to take advantage of the Campaign Monitor templates right from within Salesforce. Emails can be triggered via the Salesforce process builder. Transactional Examples: Email order details to a customer details, or fire off an email to partners when there is an update to Salesforce case. Build a Salesforce Process Builder flow to trigger the email. To use transactional you must be on a monthly billing plan with Campaign Monitor. You will also need to set up email authentication for your Campaign Monitor account. Triggering smart transactional emails requires knowledge of Salesforce Process Builder. Triggering smart transactional emails requires knowledge of Salesforce Process Builder. Smart email templates are where you design how the email looks, add content and set up variables to populated with Salesforce data. The templates are set up in Campaign Monitor to learn more click here. Should you have question on how to create a smart email template please contact Campaign Monitor directly. After you have set up a smart email template in Campaign Monitor you are ready to map the variables and define recipients. Click the Smart Emails tab. Next to the View dropdown, select All. Click Refresh List to import and update the Smart Email Templates. Select the template you want to work with by clicking the Template Name. On the Smart Email page, click the New on the Smart Email Mappings table. Enter a Smart Email Mapping Name, optionally enter a Description. Set Create Tasks to True if you would like to create a Salesforce task when an email is sent. In Field mappings, click Map next to a variable then select a Salesforce field to map it to. In Recipients you can map a Salesforce email field to receive the transactional email, and whether they receive it normally, as a CC, or as a BCC. When working with recipients you can apply filters on related objects. There are two ways to trigger a transactional email. The first, and most common is to use the Salesforce Process Builder to trigger the emails. The second is to set up a global action. If you plan to use Salesforce Process Builder you will need the Smart Email Mapping ID see the animation below. To automatically send smart transactional emails using Salesforce process builder, you need the smart email mapping ID. This is to tell the system which email to send. To get the ID. Click setup near the top right of your Salesforce account. On the left in the Quick Find search box type process builder. Below Workflow & Approvals, click Process Builder. On the My Processes page, click New. Enter a name and an API name for the new process, then click Save. From the Action Type dropdown menu, select Apex. From the Apex Class dropdown menu, select Transactional Email. From the Type menu select Field Reference. In the Value field, navigate to the record ID (for example, the Contact ID if you're working with the Contact object). From the Type menu select ID. In the Value field, paste the smart email mapping ID you copied earlier. Click Activate, then Confirm to turn the process on. On the left in the Quick Find search box type Global Actions. Once the action is in place it should appear in a records feed. If not check the object page layout to see if the global actions have been overridden.